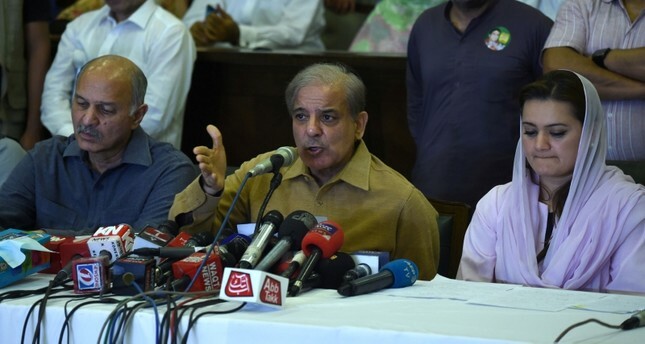 One of the main candidates in Pakistan's election, Shahbaz Sharif, rejected the results of the poll Thursday as counting was still underway, alleging "blatant" rigging. "It's such a blatant rigging that everyone has started crying. Today what they have done has pushed Pakistan back 30 years... We reject this result," Sharif, who leads the incumbent Pakistan Muslim League-Nawaz (PML-N), told a press conference in Lahore. "People will not bear it," he added. Shortly before he spoke state television said that just 18 percent of the vote had been counted so far. The contest largely became a two-way race between Imran Khan, the World Cup cricket hero turned politician who heads Pakistan Tehreek-e-Insaf (PTI), and the PML-N of ousted premier Nawaz Sharif, whose brother Shahbaz is leading its campaign. "This is not an election, it is selection -- to install someone of your own choice and to topple others," Mushahid Hussain Sayed, a senior PML-N leader, said at the press conference with Sharif. "My candidates complaining polling agents have been thrown out of polling stations across the country," tweeted PPP leader Bilawal Bhutto Zardari, adding: "Inexcusable & outrageous". Many smaller parties have also rejected the results. PTI supporters were already holding small celebrations in cities across the country, including Lahore, Islamabad, Multan and Rawalpindi, with fireworks, dancing and reports of celebratory gunshots.